Yesterday, a colleague and friend, Steve Walsh, died of a heart attack at his gym. He was 45. I know Steve through the BMW Car Club of America where we both volunteer to instruct high performance driving to anyone who wants to learn to be a better driver. In the last year, I’ve transitioned from the passenger seat to teaching the advanced classroom. Steve ran intermediate classroom and our sessions were back to back at our most recent Infineon driving school in November. He came early and sat in on my classes and occasionally chimed in or responded to a student question. I was impressed by the insightful but simply delivered advice he provided – it was effortless for him. It made me feel like I was babbling. I stuck around for one of his classes and the first thing he did was take the rows of fold-out chairs and turn them around into a circle so that everyone faced each other more intimately. That’s classic Steve. There is no question 45 is too young. It’s a terrible reminder that we must squeeze the most out of every day. Never wait. Never rest. You never know when your time is up. It could come skydiving, at the gym or sitting on the couch. There are no guarantees. Get out there and make the most of it, 24/7/365. 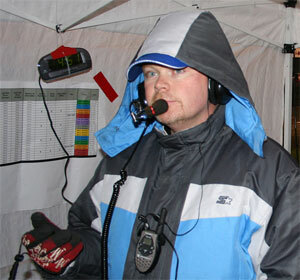 The picture above is from the middle of the night during the 2003 Thunderhill 25 Hour enduro. It’s about 2AM, around freezing temperatures and nobody had slept in 30+ hours. There were still another 10 hours to go before the race would be over. Even in this drearily-taken late-night picture, you can see the twinkle in his eyes that everyone knows and loved. It’s this cheery spirit and good natured attitude that we will all miss dearly.